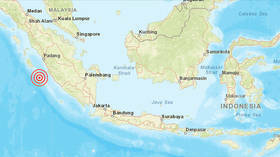 A 6.1-magnitude earthquake has been reported off the coast of Sumatra in Indonesia. The quake occurred 166km south-southeast of Muara Siberut. The United States Geographical Survey (USGS) reports the earthquake was 10 kilometers deep. Meanwhile, the Indonesian authorities are reporting the incident as a 6-magnitude quake. The Indonesian Tsunami Early Warning System says that a tsunami is not likely, but warned aftershocks could occur. Indonesia sits on the Ring of Fire and has suffered a number of recent earthquakes and tsunamis that left thousands dead. In December, more than 370 people died and 1,400 were injured in Sumatra and Java after volcanic activity caused a landslide which then triggered a huge tsunami. The island of Lombok was struck with a series of earthquakes in late summer, with August’s quake leaving 555 dead. Over 2,000 were killed in Sulawesi when it was hit with an earthquake and tsunami in September. The country was also badly affected by the 2004 Indian Ocean tsunami which left 120,000 dead.